OWG, I am so happy! I got it all done but the last wall. I had to order more clips. But, when the Fed-X man comes, it will only take a half hour to finish. Thank you so much for all your help and encouragement. I worked hours putting the base down, four corners and the front and back supports. I was ready to throw it away. Hubby found YOU on line. I saw both front and back support were put up wrong ... I wrote in with a problem and YOU answered. THANK YOU SO MUCH! BTW, I put it on my porch. It is great! Hi Oldma, you are very welcome. I'm so glad you were able to find the solution to your problem! Trying to understand the advantage of putting the aluminum tape on the ends.....and then putting holes in it. Is this not basically back where you started (open channel ends) and defeating the stated purpose of sealing the panel? If effectively sealed from bugs, dirt, and moisture with application of tape ...why not just leave it that way?? 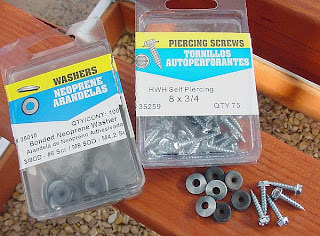 The screws/washers and the weatherstrip.....easy to see the advantages and have purchased already! Great ideas. As you suggest, I also have a sneaky suspicion that the venting on the bottom is not absolutely critical, but I haven't had the chance to prove it one way or another. I suspect this is more critical in wet climates. 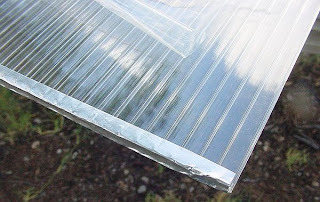 To be honest, in my hot arid climate, I'm not sure I needed the tape protection at all, but when I saw photos of folks trying to dig green goo out of the ends of their panels, I decided "better safe than sorry." Is it 560' of weatherstripping including doubling up at top and bottom? Found 3/16 x 3/8 x 17' closed cell foam for 2.49 with 20% discount @ Lowes. Not sure about foam because it doesn't state waterproof, but does state high density. Is this stuff ok? bluetumb, you have me, because I'm actually not sure if that 560 feet of weatherstripping included doubling up at the tops and bottoms of panels or not. It's been a few too many years for my memory, and my notes aren't clear. I'd say possibly not, since I think I may have discovered that the tops and bottoms needed thicker weatherstripping while I was doing the install. I'm sorry I can't be more precise. 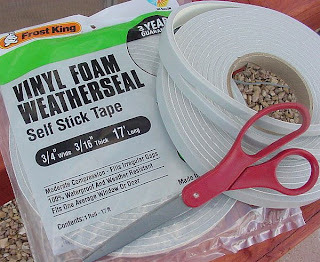 The MD High Density Foam Tape Weatherstripping you linked to, from Lowes, is exactly what I used about a month ago when I replaced my roof panels. It should be fine. Mainly I wanted to avoid the very cheap foam weatherstripping that compresses very easily and can soak up water like a sponge when wet. I noticed the packaging no longer says "closed cell" or "waterproof" like it did years ago. Sorry for any confusion. 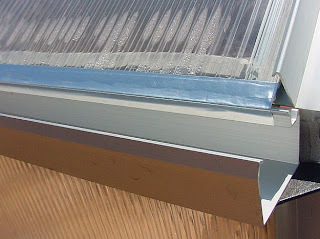 This time I bought 3/16" thick weatherstripping for the sides of my roof panels, and used 1/2" weatherstripping on the bottoms of the roof panels (no weatherstripping was used on the top of the roof panels, since they fit into the groove at the roof peak.) Or you can double up on the 3/16" thick stuff for the tops and bottoms instead of buying 1/2", that works too...whatever you need to do to close down the air gap between the panel surface and the aluminum frame. Applying the weatherstripping is admittedly a bit of a pain, as it slows down the panel installation process, but I really do think it makes a difference in the seal you get at the edges of the panels. I hope it works well for you too! I would have thought there would have been more people finding this blog site lately. It has been very helpful and after I complete the HF greenhouse I could give you some other details if you want to update it. As for now thanks and Happy Thanksgiving and blessings upon you for this undertaking. I do hope you will stay in touch, updates and helpful info are always welcome! You can post here or email me at mudhouse@q.com. Good luck with your build! 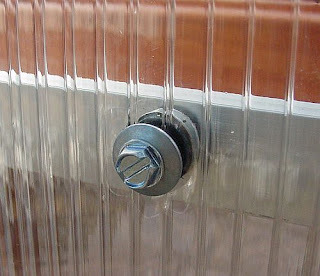 As to your suggestion to screw the panels in, what type of metal are the screws? Steel and aluminum don't get along and I assume the screws you are using do not rust? I believe the screws we bought at Lowes are plated steel. Could be the minimal contact area, could be our climate, but after over six years, we've not noticed any problems with rusting or reactions at the points where the panels are screwed to the frame. Just picked up two of the greenhouses for $510 per. With tax it cam out to $540 each. The 25% off coupon really helped! Living in WA state, it can be windy and wet. Your instructions will make this project successful and I am eternally grateful for your work in posting all this wonderful. Thank-you so much! Hello Dave, congratulations on your good buys, can't beat that price! Harbor Freight has redesigned and changed a few parts in the kit since I wrote this blog six years ago, and there are apparently old and new versions of the kit still being sold. The changes mostly seem to affect the doors, and the base pieces. So if my instructions for those areas seems to differ a bit, that's why. Hopefully it won't cause you any problems. Is there a certain sequence to installing the roof panels? I'm not sure I can reach across everything if I just start at one end and work down that side. I'm sure there is more than one way to do it. 2) start at one end of the roof, and work your way across to the other end. 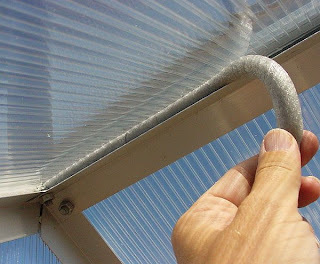 With either method, at the end, you'll end up with the ladder on the outside of the greenhouse, reaching to clip the outer panel in place at the edge of the roof. The only thing that would not work is to do the end panels first, and leave the center roof panels for last. We've put roof panels on twice now, once when the greenhouse was new about six years ago, and again about two years ago when we had to replace the roof panels as they had deteriorated from sun exposure. I will be honest with you that there are a few spots that are really a challenge to reach. It's not my favorite part of the build. My husband is over 6' tall, and fortunately has long arms. He was able to place some of the final clips in the tough spots, using an 8' tall step ladder, that I simply would not have been able to reach myself (5' 6"). We used two step ladders, 6' and 8', and could not have done it without the 8' ladder, if that helps. Scroll all the way up to the very top of this page, at the start of this section (Part Six, Adding the Panels.) I talk a bit about adding tape to the top and bottoms of the panels, to keep bugs and moisture out of the tiny channels. When I wrote this blog, I used aluminum tape from Lowes (cut to a thinner width) to seal the panel ends. In my very hot sunny climate, I found the aluminum tape started to come off after about two years. Now I use clear duct tape instead, cut to 1/2 width, to seal the panel tops and bottoms. Conventional wisdom is to allow the bottom of the panel to "breathe" and let moisture escape through holes in the tape. That's why I show piercing mine, on the bottom, in the photos. I've learned this really isn't necessary in my dry climate, so now I just seal both ends. 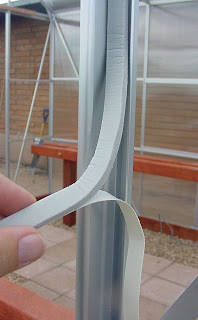 You can also buy a tape specially made for sealing the ends of polycarbonate panels through greenhouse supply companies online. I think these tapes are usually breathable (slightly perforated.) They might have a much better adhesion than my cheaper alternatives. I have read that some folks actually use caulk on the panel ends, to seal those little channels, but I can't imagine how a person could do that without making a big mess! I think some kind of tape is easier to apply, personally. Hope this helps. So am wondering how much of the greenhouse can I assemble when it's windy? The base obviously and figure I can tape and put the weather stripping on the pannels but not sure how far I can go on the rest of the frame? I plan on putting 2x4's at the studs. Thanks again. The frame itself has very little wind resistance, so we don't think you will have any problems working in the wind, until you start to install the panels. Installing the panels in bad wind might be a good way to take up hang gliding, accidentally. ;-) So wait for calmer hours to work on adding those, and you should be fine. So aside from a possible bad hair day, you should be able to make good progress on the whole frame. Thank you again so much for the advice. Finally we are having better warmer weather but the april showers is getting annoying already. lol But picked up my lumber yesterday and got it all hauled to the back yard today and got the fire pit moved as well. lol and tonight got the long wall side panels and roof panels taped and weather stripped and the two vent windows assembled. Just very nervous about getting the foundation and frame level and square. Hi Cindy, just take your time, and check things as you go. You can use a level and a square to make sure things are right. For me, it's much more stressful to try to rush a project like this. I'm sure you'll do fine, just work at a pace that feels right to you. Thank you so much for your helpful blog. I'm putting my panels on now, and noticed that the front panels on either side of the sliding doors don't have any brace to rest on at the top. The sides and bottom are supported, but there is nothing at the top. Anyone have this problem? I suppose I can get some aluminum channel and make my own brace, but I didn't see this mentioned anywhere. Have I missed something? I'm away helping a family member recover from surgery, but I have a very fuzzy memory of what you are describing. It could be that the way the top aluminum door plate is designed, it doesn't quite contact the top of the panels as much as the greenhouse frame does on the bottom and sides, but I'm afraid it's been too many years for me to remember this detail clearly. When I get back and have access to my own greenhouse, to check this area, I will try to post again. I'm sorry to not have a better answer for you right now. 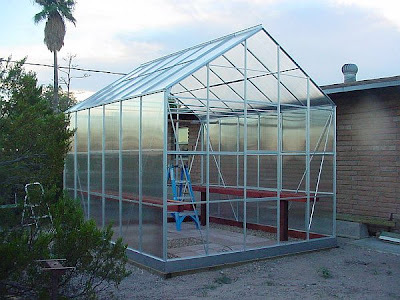 I just constructed my 6x8 HF greenhouse this weekend before finding your blog. Glad I did find it tho - will use several of your enhancement ideas. Thanks! My question is where to find extra clips. I may have missed your suggestion. I only found a place out of England which seemed a bit far. Any suggestions? I live in Portland OR. Harbor Freight only sells the clips through their toll free number; they don't stock them in their stores, or sell them on their website. I must be missing something simple on installing clips. I do not understand how to do it easily. Do you put the clip on the panel and then push the panel towards the frame? No, you set the panel in place into the framework opening, and then use the clip to secure it to the frame. The clips won't stay on the panel itself; they are held in place by the springy tension they apply between the panel and the aluminum frame. ...and scroll down about 1/5 of the way down this page, to find the section I have titled Aluminet Shade Cloth Screen Panels. 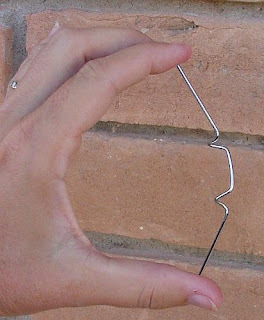 The fifth photo in this section shows a clip installed, up close. 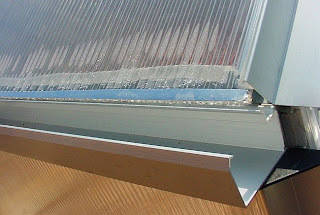 When I install these, I position both of the free ends (let's call these the feet) so that they are captured by the track in the aluminum frame, as shown in the photo. While keeping those feet in place, push on the rounded center of the clip, sliding it across the surface of the panel, moving towards the track. You'll have to push a bit hard. This compresses the clip, and when you push the clip to the edge of the panel, the two "shoulder bends" will suddenly pop behind the panel edge, and the center of the clip will remain pushing down on top of the panel. 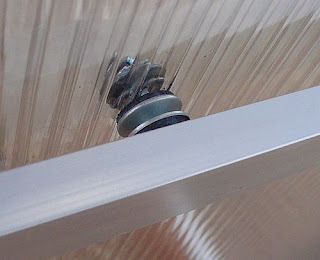 The feet are captured by the track, the two "shoulders" slip just behind the edge of the panel, and the rounded central portion of the clip winds up bearing down with a bit of pressure on the outside surface of the panel. I know that is probably as clear as mud (it really is super simple, but the words make it sound terribly complicated.) I hope this helps a bit. Please let me know if I've only made things more confusing! Your blog helped us tremendously while building our 10 x 12 greenhouse, thanks! My one question is how in the world do you reach the window gadgets to open and close the windows at such a height? Hello Hayley, well, I don't have a good answer for you. I used a small two-step aluminum step ladder for a while, to open and close the window vents as needed. This got old very quickly, especially because my greenhouse is filled with cacti, and I was teetering over benches full of scary spines, when I was up on the little step ladder. Unlike many HF owners, I eventually gave up on my roof vents. In my location, the prevailing winds could pick up the roof vents just a tad, even when they were in the "closed down" position. Although the vents raised only a fraction of an inch, it was enough for a constant bang-bang-bang vibration on windy days. This eventually caused my poly panels in the windows to wiggle out of place. I caulked those in, but the annoying banging continued. I finally wired them shut, and gave up. I could only get away with this because I installed an exhaust fan for cooling, and I also replace the south wall in the summer with screens. I don't really recommend this because normally roof vents are very important for cooling. What I should have done is to look into automatic roof vent openers. These are non-electric openers you can purchase from greenhouse supply companies. They have a wax-filled tube that responds to temperatures, moving an arm to automatically open and close your vents. Bayliss and Univent are two brands that get better reviews. I eventually removed my roof vents entirely, when I had to replace the greenhouse roof panels a few years ago. So I don't have any experience with the automated openers, but many folks speak highly of them. AWESOME Information!! THank you So MUCH!! You're so welcome Jake, glad it helped! Hi JoAnn, I'm so glad you've found some help here. I realize that Harbor Freight has changed some parts of the kit (and manual) since I wrote this blog, so I hope there aren't too many differences that cause confusion. Your tip about the waterproof Gorilla Clear Repair tape is much appreciated. I'll be sure to use that when I tape my next set of panels. I have used the Gorilla brand duct tape and it's better than average, so I'll bet their clear waterproof tape will be perfect for the job. Thank you! Hoping for clear skies for you, and a successful completion of your build! I"d like to second Joann's comments. Your blog has been terrific, and almost a necessity since Harbor Freight's manual is quite basic, to say the least. Thank you for the great photos and suggestions for upgrades. Those of us in windy areas surely have much to be grateful to you for. Thank you Fran, glad this is helpful! 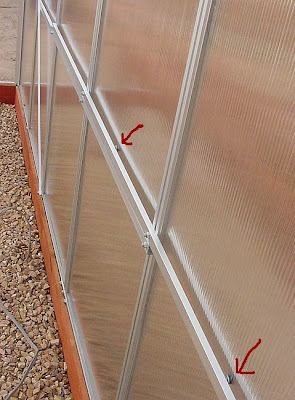 I really hate to hear about wind damage to these structures, and I am eternally grateful to the early owners of the HF 10x12 greenhouses that figured out many of these necessary "fixes", and posted them on the web to help the rest of us. We are going into our 8th year now with no wind damage...thanks to screws in the panels, modifications to prevent flexing, and extra clips. Good luck with your build, and happy growing! Abraham, I use a swivel hasp to keep the doors closed. It works well. Found it at Walmart, but you can find them at most hardware stores. No lock is needed, just turn the swivel piece to secure it. Email me for a photo; can't figure how to attach one here. I also live in New Mexico, like MudHouse, but I'm in Santa Fe, at 7,800 ft elevation with a LOT of ultraviolet exposure. Our upper panels pitted everyhere on the outside and all non-north facing panels became yellow & brittle after about 18 months. FYI, As of March 2016, it appears that HF is no longer selling a full replacement set of polycarbonate twin wall 4mm panels. If you call HF regular number/ordering dept, they have individual panels, sub-parts numbers 55 through 64, at a cost of $10-$18 each. As there are 51 separate panels, it would cost more than the entire greenhouse to get a complete replacement set. I'm looking for some source to get these at a better price, but have not been able to find one. 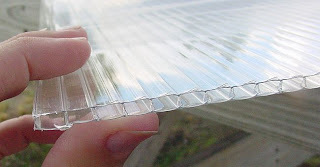 And thank you also, Samsunshine, for the info about HF not selling replacement sets of their polycarbonate panels. We're looking at replacing most of our panels this summer. This will be the second time we've replaced the roof panels; the last set was fatally wounded by a hail storm in October. 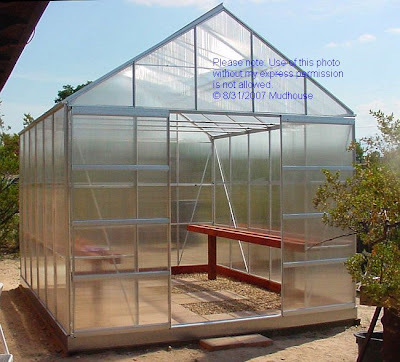 Your suggestion about facing the panels with greenhouse quality polyethylene makes sense. It does seem like that would certainly extend the lifespan of the Harbor Freight panels. We used the same product over our (damaged) greenhouse roof to get us through the winter, and it has held up fine. I do think it affects how much light comes through the panels, slightly, but that's not a problem in our state! I'd love to avoid doing a re-roof for (dare I hope?) another ten years or so. 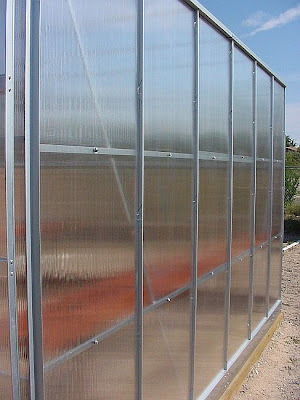 I'll probably bite the bullet and order sheets of 4mm polycarbonate from a greenhouse supply company. Most twinwall polycarbonate sold elsewhere (with true UV protection) has a ten year warranty, so it should last much longer than the Harbor Freight poly panels. I'll have to use my old panels as templates and cut them from the new material. The north wall of our greenhouse (covered with insulation, and protected from the sun by our house) still looks like new, so I won't replace that side. I need to do a more careful calculation, but I roughly estimated that 6 sheets of 4' by 8' 4mm twinwall polycarbonate might be enough for us. If it helps you, in October 2015, I did an online chat with FarmTek.com, and they quoted a total price of $432.48, for six sheets. That was $311.70 for the poly, and $120.78 for packing and shipping, to me here in Las Cruces. I actually thought the packing/shipping would be more, because I believe it has to be crated, but that's what they quoted. I'll re-confirm it all with them in the next few months when I'm ready to tackle the project. I'm looking at replacing my south facing wall and the south facing roof up here in Santa Fe. Interestingly, Solexx (10 year UV warranty supposedly) comes in 146" (just over 12') lengths. By my calculations (I have to go out and measure the panels), 146" is EXACTLY the height of one wall panel plus one roof panel - assuming you make the cut perfectly. One 4' wide sheet does two segments/4 panels from making only three straight cuts. 3 pieces will re-do the entire south face and roof (or re-do an entire roof-only). 3 pieces of XP 3.5mm, delivered is $243 from https://www.terratech.net/product.asp?specific=jmnrqqhnq (also from Staples/Wayfair/Sears/Walmart online for a few dollars more). That is basically the SAME price as HF is currently quoting for one-at-a-time panels ($16 wall, $14 roof, not including tax & shipping), for something that could last five times as long! Pro 5mm is $58 more, though yes I know I'd have to compress it to squeeze in at ridgeline upper corners. Then I can optionally add 50 glazing clips ($9.67 amazon) and a roll of UV treated plastic (above post, also from Amazon) and I've still got plenty of foil tape. Yes, I've looked hard at Solexx too! 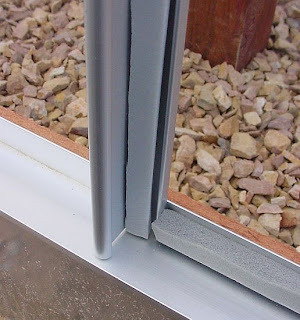 According to the Solexx website, it also has a higher R value (insulating ability) and lower U value (heat loss) than 4mm twinwall polycarbonate. That's appealing. I only have two concerns with Solexx. One, it's a translucent white material, not clear, and I'm not sure I'd like how it looks; I guess that sounds vain, but our GH is very visible to many neighbors. More importantly, I wonder if it would cause me to replace my 60% Aluminet shadecloth on the roof with a lower percentage. The white material should screen out some of the intense sun, but coupled with my current shadecloth, it might be too shady for my sun-loving succulents. I've even thought about buying Solexx for the roof, to see if I could eliminate shadecloth on my roof entirely. 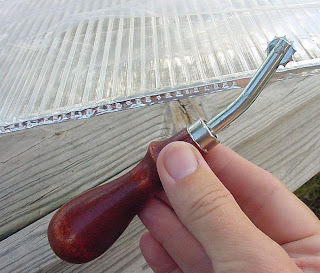 And buying clear polycarbonate for the sides, to look all sparkly pretty for my neighbors. Decisions, decisions. Argh! It's not easy. Just posting a correction here, to my post abov,e about the number of 4' by 8' sheets of twinwall polycarbonate needed. Sorry; I misread my notes when I posted above; I'll need six sheets (about $432) to replace my roof alone, and of course much more to replace the deteriorating side walls. So, not an inexpensive proposition, no matter how you slice it. Hi Sheri, First of all thank you so much for your blog and all the amazing pictures, feedback, design improvement, etc. I'm about to put up a new HFGH 10 x 12. I'm considering using solexx over the whole thing. I may use the existing new panels additionally as extra insulation but would also consider selling them if any other nm folks would like replacement panels since there not available any more. I live up in Taos. I bought the greenhouse last fall and it has been stored out of the sun so all the panels should be perfect. I'd sell them for the old harbor freight replacement price if anyone is interested. If any New Mexico folks contact me looking for a set of 10 x 12 Harbor Freight panels, I will be sure to post back here, to let you know. Best of luck on your build, in beautiful Taos!